The city explained what causes potholes, how the city is working to repair them faster, and how the public can help in a blog last week. The number of potholes grows exponentially in the winter, according to officials. When water seeps into the road and freezes, it expands, which often causes a pothole eventually. A lot of traffic means quicker-forming potholes. There are up to 10 city crews assigned to repairing potholes at most hours, according to the city. However, rainy weather in the winter is a “double-whammy.” Heavy rain accelerates the pothole-forming process. Also, when rain fills the holes, crews aren’t able to repair them. Still, last year the city repaired close to 63,000 potholes. 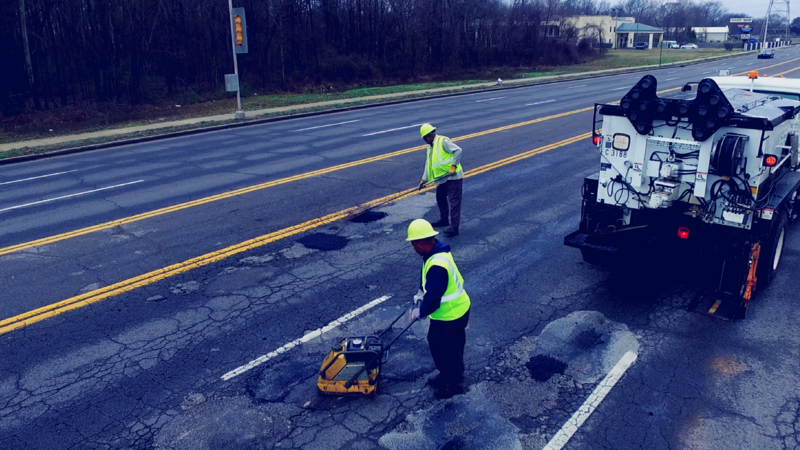 The city asks that the public report potholes by using the Memphis 311 app, submitting a report online, or calling 311 between 8 a.m. and 5 p.m. Also, if your car has been damaged by a pothole on a city street, you can file a claim with the city. In step with tracking and repairing potholes faster, the city is in the early stages of a partnership with a technology company in order to pilot a project that could allow cameras attached to city-owned vehicles to scan for potholes. The effort was announced during Memphis Mayor Jim Strickland’s State of the City Address last month. As the project is still in developing phases, Dan Springer, the city’s deputy director of media affairs, said he is not able to name the company that the city is partnering with at this time. Still, the long-term solution for potholes is paving more streets. The city said it is working to catch up on the backlog in street paving due to the small amounts of funding allocated for re-paving in the past. The city’s current fiscal year budget sets aside $19 million for paving, compared to $16.5 million during Strickland’s first year in office in 2016, $15 million in 2015 during the last year of A.C. Wharton’s tenure, and $5.8 million during Wharton’s first year in 2009. But, Memphis can only pave so many of the approximate 6,800 lane-miles of road in the city, estimating it would costs “more than half a billion dollars” to re-pave every street in the city. The entire capital budget was $87 million for fiscal year 2018. As the temperatures begin to rise, crews will begin repaving these streets.